Rockfish and tilapia are both general names for various types of white-meat fish. These fish are popular dinner items and offer health and nutritional benefits. Tilapia is a fresh water cichlid. Although the genus Tilapia includes many species, tilapia is the only market name. Unlike tilapia, rockfish has many common market names such as cod, bass and Pacific red snapper. Tilapia and rockfish are both low-fat foods. Consuming white meat fish is a healthy alternative to red meat. FDA testing shows that Tilapia is low in mercury because it has a short lifespan. Rockfish has higher rates of mercury because it lives up to 200 years. Pregnant women should choose tilapia over rockfish due to mercury concentrations. Tilapia is an invasive freshwater species that originated in the tropics. 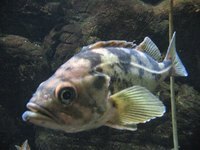 Rockfish is a saltwater species and is primarily harvested by the fishing industry, with minimal farming. While both fish are farmed, tilapia's fast growth makes it especially economically attractive for aquaculture. Tilapia which escape the closed aquatic environments, however, pose a threat in competition with native species in the southeastern U.S.